To Cite: Sanaei Dashti A, Kadivar M R, Tabatabai A, Zand F, Salami S, et al. Prevalence of Healthcare-Associated Infections in Pediatric Wards of Nemazee Teaching Hospital in Shiraz: A Comparison with the Whole Hospital, Arch Pediatr Infect Dis. 2019 ; 7(1):e83488. doi: 10.5812/pedinfect.83488. Background: The risk of healthcare-associated infections (HAIs) in the developing countries can be up to 20 times greater than the developed countries. Objectives: As the prevalence of HAIs varies even in different wards of a hospital, this study aimed to estimate the prevalence of HAIs in pediatric wards and to compare it with the whole hospital. Methods: This cross-sectional study was conducted in Nemazee Teaching Hospital in Shiraz. We used registered data that was reported monthly during a one-year period (March 20, 2016 to March 20, 2017). Statistical analysis was performed using SPSS software. Results: The average prevalence of HAIs in pediatric wards was 7.77%, while it was 11.38% for the whole hospital. The most prevalent HAIs in the whole hospital and in pediatric wards were urinary tract and blood stream infections, respectively. The mean rate of HAIs was significantly different between various pediatric wards (F = 29.50, P = 0.0001) and all wards of the hospital (F = 27.16, P = 0.0001) (P < 0.05). Investigation of the prevalence of HAIs in the critical, medical, and surgical wards showed the highest prevalence in the critical care ward (13.22% in pediatric wards vs. 17.45% in the whole hospital). Acinetobacter was the most common microorganism causing HAIs in the whole hospital. Conclusions: Considering the prevalence of urinary tract infections in the whole hospital and blood stream infections in pediatric wards, preventive strategies to reduce the infections should be adopted. The high prevalence of HAIs in critical care wards even in pediatric wards compared to medical and surgical wards indicates the importance of interventions in such wards, especially for children with a weak immune system. Healthcare-associated infections (HAIs) are an increasingly recognized problem in hospitals (1). The World Health Organization (WHO) has reported that the risk of HAIs in the developing countries can be up to 20 times greater than in the developed ones and the proportion of infected patients regularly exceeds 25% (2, 3). It is estimated that more than 1.4 million people worldwide contract hospital infections (4, 5). This high rate of nosocomial infections leads to more antibiotic usage and higher emergence of antibiotic-resistant microorganisms (6). Reports show that the prevalence of HAIs varies from 6% to 27% in some developing countries (3). However, the results of a systematic review on the burden of HAIs indicated that this rate varies between 5.7 and 19.1 per 100 patients with a pooled prevalence of 10.1 (7). A surveillance study across 95 large hospitals in Iran performed by the Iranian Center of Disease Control (ICDC) demonstrated that the prevalence of HAIs was about 0.57% during 2012 through 2014. Undoubtedly, this is an underestimation that could be due to an inefficient hospital surveillance system in the country (8). Another study carried out in two large cities of Iran, Mashhad and Shiraz, showed the overall prevalence rates of HAIs to be 0.8% and 9.4%, respectively (9). In Iran, HAIs have the highest prevalence in intensive care units (ICUs; 26.7%), and they are associated with considerable morbidities, mortalities and costs (8, 10-12). Based on the site of HAIs, previous studies in Iran have presented different results. Although ICDC has reported urinary tract infection (UTI) as the most (32.2%) and bloodstream infection (BSI) as the least common infections (16.3%) (8), a study in Qazvin, Iran, revealed respiratory tract infections (RTIs) to be at the top of the list of HAIs (13), and another study in Mashhad, Iran, also showed the most frequent HAI was pneumonia (25%), followed by UTI (20%), and BSI (19%) (9). It is worth mentioning that, the most common HAIs are different between adult and pediatric populations. Although most studies have indicated that UTI is the most common infection, investigations on the pediatric population reported BSI as the most prevalent infection (8, 14-17). According to a prevalence survey across 23 European countries, the most common infections were pneumonia and other lower RTIs (25.7%) (18). Escherichia coli (E. coli) was the most common cause of BSIs (19, 20). In the majority of previous studies in Iran, E. coli was also mentioned as the most common cause of UTIs (21, 22). However, according to a study in three teaching hospitals with 34,556 hospitalized pediatric patients, Pseudomonas spp. (36.84%) and Acinetobacter spp. (28.02%) were the most common pathogens in north of Iran (21). To the best of our knowledge, there is a scarcity of studies comparing HAIs in pediatric wards to the whole hospital wards in Shiraz city, Iran. This study aimed to estimate the prevalence of HAIs in the pediatric wards of Nemazee Hospital and compare it with the whole hospital. This retrospective cross-sectional study was a hospital-wide survey performed in Nemazee Teaching Hospital with 1000 beds in southwest of Iran. We used the registered data of the hospital reported every month during a one-year period (March 20, 2016 through March 20, 2017). Overall, 9,560 hospitalized patients were included in this study. All the wards were actively screened by trained infection control personnel and the reported cases were reviewed and screened further by an infectious diseases subspecialist experienced in infection control. The criteria for the diagnosis of infection were based on the instructions of the National Ministry of Health that are very similar to ICDC guidelines (23). The reported prevalence was based on the information of 75% of the whole hospital. For more convenience, we divided the data into whole hospital and pediatric wards. Hospital wards were also classified into three main ward types, namely critical care (10 for adults and 6 for children) medical (14 for adults and 6 for children) and surgical wards (6 for adults and 2 for children). The critical care wards included 15 ICUs, 3 coronary care units (CCU) and 2 organ transplant units. Four major HAI types including BSIs, RTIs, UTIs and surgical site infections (SSI) were recorded and compared among wards. Statistical analysis was performed using SPSS, version 21. To compare the differences in the prevalence of HAIs in the three main wards between the pediatric wards and the whole hospital, one-way analysis of variance (ANOVA) was used. Independent samples t-test was run to determine the relationship between similar wards (critical care, medical, and surgical) in the pediatric wards and the whole hospital. P value less than 0.05 was considered significant. The total prevalence rate of HAIs in the pediatric wards was 7.77% (95% CI 2.73 - 13.22), while it was 11.38% for the whole hospital (95% CI 4.16 - 17.45). The prevalence rates of HAIs in the critical, medical and surgical wards were also compared. The highest prevalence rate of HAIs was in the critical care wards; it was 13.22% in pediatric critical care wards and 17.45% in critical wards of the whole hospital (Figure 1). According to the site of infection, hospital-acquired UTIs were observed in 36% of the whole hospital as the most prevalent HAIs, while it was the least prevalent infection in pediatric wards (4%). Regardless of the site of infection, the most common microorganism causing HAIs was Acinetobacter that was responsible for 16.99% of the total HAIs in the whole hospital. E. coli was the most common microorganism causing UTIs, while Acinetobacter was the most common microorganism causing RTIs and SSIs (Table 1). Figure 2 illustrates the prevalence of HAIs according to the four infection types in pediatric wards compared to the whole hospital. The most prevalent HAI in critical care wards was lower RTI in both pediatric wards and the whole hospital (10% vs. 21%, respectively). In medical wards, BSIs were more prevalent in pediatric wards (15%), while in the whole hospital, UTIs were more common (28%). The prevalence of SSIs in the whole hospital was more than twice as high as the rate in the pediatric wards. One-way ANOVA showed that the mean percentage of HAIs was significantly dissimilar between different pediatric wards (F = 29.50, P = 0.0001) and the whole hospital (F = 27.16, P = 0.0001) (P < 0.05). According to independent samples t-test, an mean rate of hospital infections was 13.22% for pediatric critical care wards and 18.93% critical care wards of the whole hospital. The mean rates of HAIs in pediatric medical and surgical wards were approximately half of the mean rates of HAIs in the medical and surgical wards in the whole hospital (7.36 vs. 14.23 in medical and 2.81 vs. 4.57 in surgical wards). 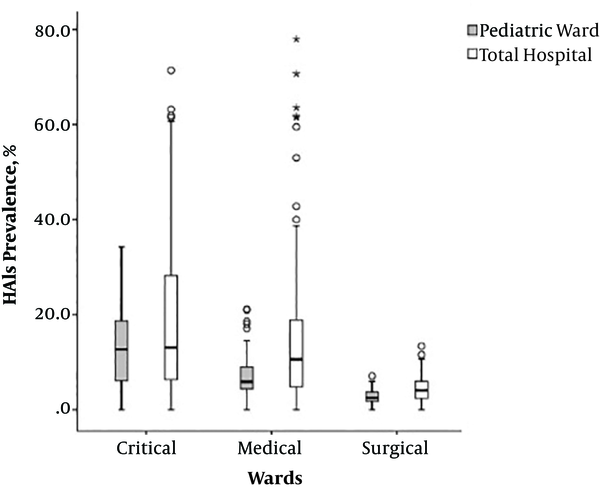 The differences in the mean rates of HAIs in critical care, medical and surgical wards were significant between pediatric wards and the whole hospital (P < 0.05; Table 2). The overall prevalence rate of HAIs in the whole wards of Nemazee Hospital was 11.38%, while it was 7.77% in the pediatric wards. In a study by Gravel et al. the prevalence of HAIs among the pediatric population was reported 8%, which was somewhat similar to our finding (24). The difference in HAIs prevalence between adults and children has been also mentioned by Foster and Sabella (25). The probable reasons for lower HAIs in pediatric wards could be more hand hygiene compliance by both health care providers and parents, shorter length of hospitalization in pediatric patients and less co-morbidities in children than adults. In the whole hospital, the most frequent HAIs were UTI (36%), followed by BSI (25%) and RTI (24%). This is in line with a surveillance study across 95 large hospitals in Iran that showed UTI was the most prevalent infection (8). In addition, a similar study that was also conducted in Shiraz showed that UTI is the most frequent site of nosocomial infections (15). The pattern of common infections in pediatric wards was different from that of the whole hospital; the most common infections were BSI (15%), lower RTI (10%) and SSI (6%), respectively, which is consistent with previous findings (16, 24). In a study by Zingg et al. and two studies in Brazil and Italy, BSIs were mentioned as the most prevalent types of HAIs in children (14, 16). Another study in pediatric wards of Isfahan reported RTI as the most common HAIs (26). A similar study in Shiraz pointed at BSI as the most prevalent HAI (27). This showed how a separate survey on adults and children can affect the reports. Although BSI was the most common infection in pediatric wards, it was 10% more prevalent in the whole hospital as the second prevalent infection. Higher prevalence of BSI in pediatric wards may be due to the presence of multiple risk factors such as their immature immune system and probably more usage of central vascular catheters in pediatric wards that is also mentioned in previous findings (16, 24). Peripheral intravenous access in children, especially infants and young children, is more difficult than in adults, so after many fruitless trials a central line is inserted for them. Thus, indwelling central catheterization and lower age can be recognized as risk factors for HAIs (28). Regardless of the site of infection, the most common microorganism causing HAIs was Acinetobacter that was responsible for 16.99% of the total HAIs in the whole hospital. Similar to the present study, Meric et al. and Gladstone et al. noted that Acinetobacter was one of the most contaminating microorganisms (22, 29, 30). E. coli was the most common microorganism causing UTIs, which is similar to previous findings (21, 22). In the current study, Acinetobacter was the most common microorganism causing RTIs and SSIs. Similar to our results, Gladstone et al. reported Acinetobacter as the second most prevalent agent causing RTIs (30). Comparison of HAIs in different wards showed higher rate of HAIs in critical care wards in both pediatric and whole wards of the hospital. However, this rate was lower in pediatric wards. The mean rates of HAIs in pediatric medical and surgical wards were approximately half of the mean HAIs rate in the whole hospital. This is consistent with previous studies in Iran that showed the highest prevalence of HAIs were observed in ICUs (8, 12, 13). All types of infections were more prevalent in the whole hospital in comparison to the pediatric wards. These lower rates could be explained by better infection control practice in pediatric wards, less hospitalization duration of patients, more appropriate antibiotic usage, better hand hygiene compliance and other factors. However, in adult wards, strict adherence to hand hygiene practice, especially the WHO guidelines, on hand hygiene in health care should be considered to reduce the spread of HAIs (31-37). An important limitation of this study was reporting prevalence based on the information of 75% of the whole wards. Although the neglected ones could somewhat affect the results, evidence showed that under the best circumstances, about 70% of the real prevalence of HAIs can be found in Iran (8). Therefore, improved HAIs detection and registry should be more emphasized in wards where cases of infection are still not reported. Moreover, the population examined in this study were admitted to a major teaching hospital and is not entirely representative of all hospitalized pediatric population in Shiraz city. Unfortunately, HAI databases of the hospital did not report catheter-associated infections, which should be considered in the future infection control strategies to have a more comprehensive research. Considering the prevalence of UTIs in hospitals and BSIs in pediatric wards, preventive strategies to control these types of infections should be adopted. These findings suggest that age-adapted strategies should be considered in order to prevent and control infections in pediatric wards, where BSIs are more prevalent. Although the mean rate of HAIs in pediatric wards is lower than in the whole hospital, their prevalence in critical care wards is high. This indicates the priority of interventions in these wards, especially for pediatric patients with a weak immune system. Regarding the contradictory results about the most common HAIs in different cities of Iran and in different hospital wards, risk factors should be studied in future studies. Moreover, it seems that sensitivity of caregivers and nurses leads to more infection control in pediatric wards, but this hypothesis needs more investigation. The authors wish to thank all members of the hand hygiene improvement program, especially the matron and nursing supervisors, for their cooperation in the implementation of this study. Conflict of Interest: The authors declare no competing interests. 1. Cardo D, Dennehy PH, Halverson P, Fishman N, Kohn M, Murphy CL, et al. Moving toward elimination of healthcare-associated infections: A call to action. Am J Infect Control. 2010;38(9):671-5. doi: 10.1016/j.ajic.2010.09.001. [PubMed: 21058460]. 2. World Health Organization. WHO guidelines on hand hygiene in health care. First global patient safety challenge clean care is safer care. 2009. 2017. Available from: int/publications/2009/9789241597906_eng pdf. 3. Pittet D, Allegranzi B, Storr J, Bagheri Nejad S, Dziekan G, Leotsakos A, et al. Infection control as a major World Health Organization priority for developing countries. J Hosp Infect. 2008;68(4):285-92. doi: 10.1016/j.jhin.2007.12.013. [PubMed: 18329137]. 4. Tikhomirov E. WHO programme for the control of hospital infections. Chemioterapia. 1987;6(3):148-51. [PubMed: 3607925]. 5. Harrison WA, Griffith CJ, Ayers T, Michaels B. Bacterial transfer and cross-contamination potential associated with paper-towel dispensing. Am J Infect Control. 2003;31(7):387-91. doi: 10.1067/mic.2003.81. [PubMed: 14639433]. 6. Fahimzad A, Eydian Z, Karimi A, Shiva F, Sayyahfar S, Kahbazi M, et al. Surveillance of antibiotic consumption point prevalence survey 2014: Antimicrobial prescribing in pediatrics wards of 16 Iranian hospitals. Arch Iran Med. 2016;19(3):204-9. [PubMed: 26923893]. 7. Allegranzi B, Bagheri Nejad S, Combescure C, Graafmans W, Attar H, Donaldson L, et al. Burden of endemic health-care-associated infection in developing countries: Systematic review and meta-analysis. Lancet. 2011;377(9761):228-41. doi: 10.1016/S0140-6736(10)61458-4. [PubMed: 21146207]. 8. Zahraei SM, Eshrati B, Masoumi Asl H, Pezeshki Z. Epidemiology of four main nosocomial infections in Iran during March 2007 - March 2008 based on the findings of a routine surveillance system. Arch Iran Med. 2012;15(12):764-6. [PubMed: 23199249]. 9. Ziaee M, Vafaeenejad R, Bakhtiari G, Mostafavi I, Gheibi M, Mahmoudi Fathabadi J, et al. National nosocomial infection surveillance system–based study in north eastern of IRAN. Soc Determinant Health. 2017;3(2):64-9. 10. Vincent JL, Rello J, Marshall J, Silva E, Anzueto A, Martin CD, et al. International study of the prevalence and outcomes of infection in intensive care units. JAMA. 2009;302(21):2323-9. doi: 10.1001/jama.2009.1754. [PubMed: 19952319]. 11. Kouchak F, Askarian M. Nosocomial infections: The definition criteria. Iran J Med Sci. 2012;37(2):72-3. [PubMed: 23115435]. [PubMed Central: PMC3470069]. 12. Rafiee M, Saeedi R, Abtahi M, Ghalami S, Jahangiri-Rad M. Prevalence of hospital-acquired infections in intensive care units in public hospitals in Tehran, Iran, in 2012-2014. J Adv in Environ Health Res. 2016;4(1):34-41. 13. Farzianpour F, Bakhtiari A, Mohammadi M, Khosravizadeh O, Mossavi H, Mohseni M, et al. Analysis of nosocomial infections in selected teaching hospitals, Qazvin, Iran. Health. 2014;6(18):2425-32. doi: 10.4236/health.2014.618279. 14. Folgori L, Bernaschi P, Piga S, Carletti M, Cunha FP, Lara PH, et al. Healthcare-associated infections in pediatric and neonatal intensive care units: Impact of underlying risk factors and antimicrobial resistance on 30-day case-fatality in Italy and BRAZIL. Infect Control Hosp Epidemiol. 2016;37(11):1302-9. doi: 10.1017/ice.2016.185. [PubMed: 27511591]. 15. Askarian M, Mahmoudi H, Assadian O. Incidence of nosocomial infections in a big university affiliated hospital in Shiraz, Iran: A six-month experience. Int J Prev Med. 2013;4(3):366-72. [PubMed: 23626895]. [PubMed Central: PMC3634177]. 16. Zingg W, Hopkins S, Gayet-Ageron A, Holmes A, Sharland M, Suetens C, et al. Health-care-associated infections in neonates, children, and adolescents: An analysis of paediatric data from the European Centre for Disease Prevention and Control point-prevalence survey. Lancet Infect Dis. 2017;17(4):381-9. doi: 10.1016/S1473-3099(16)30517-5. [PubMed: 28089444]. 17. Lambert ML, Suetens C, Savey A, Palomar M, Hiesmayr M, Morales I, et al. Clinical outcomes of health-care-associated infections and antimicrobial resistance in patients admitted to European intensive-care units: A cohort study. Lancet Infect Dis. 2011;11(1):30-8. doi: 10.1016/S1473-3099(10)70258-9. [PubMed: 21126917]. 18. Zarb P, Coignard B, Griskeviciene J, Muller A, Vankerckhoven V, Weist K, et al. The European centre for disease prevention and control (ECDC) pilot point prevalence survey of healthcare-associated infections and antimicrobial use. Euro Surveill. 2012;17(46). doi: 10.2807/ese.17.46.20316-en. [PubMed: 23171822]. 19. Valles J, Calbo E, Anoro E, Fontanals D, Xercavins M, Espejo E, et al. Bloodstream infections in adults: Importance of healthcare-associated infections. J Infect. 2008;56(1):27-34. doi: 10.1016/j.jinf.2007.10.001. [PubMed: 18022242]. 20. Son JS, Song JH, Ko KS, Yeom JS, Ki HK, Kim SW, et al. Bloodstream infections and clinical significance of healthcare-associated bacteremia: A multicenter surveillance study in Korean hospitals. J Korean Med Sci. 2010;25(7):992-8. doi: 10.3346/jkms.2010.25.7.992. [PubMed: 20592888]. [PubMed Central: PMC2890898]. 21. Behzadnia S, Davoudi A, Rezai MS, Ahangarkani F. Nosocomial infections in pediatric population and antibiotic resistance of the causative organisms in north of Iran. Iran Red Crescent Med J. 2014;16(2). e14562. doi: 10.5812/ircmj.14562. [PubMed: 24719744]. [PubMed Central: PMC3965877]. 22. Rezai MS, Salehifar E, Rafiei A, Langaee T, Rafati M, Shafahi K, et al. Characterization of Multidrug Resistant Extended-Spectrum Beta-Lactamase-Producing Escherichia coli among Uropathogens of Pediatrics in North of Iran. Biomed Res Int. 2015;2015:309478. doi: 10.1155/2015/309478. [PubMed: 26064896]. [PubMed Central: PMC4433631]. 23. Ministry of Health and Medical Education. National Guideline of nosocomial infections surveillance. Iran. 2007. Available from: http://vct.iums.ac.ir/uploads/rahnama_ofounat_bimarestani_ke.pdf. 24. Gravel D, Matlow A, Ofner-Agostini M, Loeb M, Johnston L, Bryce E, et al. A point prevalence survey of health care-associated infections in pediatric populations in major Canadian acute care hospitals. Am J Infect Control. 2007;35(3):157-62. doi: 10.1016/j.ajic.2006.06.006. [PubMed: 17433938]. 25. Foster CB, Sabella C. Health care--associated infections in children. JAMA. 2011;305(14):1480-1. doi: 10.1001/jama.2011.449. [PubMed: 21486980]. 26. Pourakbari B, Rezaizadeh G, Mahmoudi S, Mamishi S. Epidemiology of nosocomial infections in pediatric patients in an Iranian referral hospital. J Prev Med Hyg. 2012;53(4):204-6. [PubMed: 23469589]. 27. Askarian M, Yadollahi M, Assadian O. Point prevalence and risk factors of hospital acquired infections in a cluster of university-affiliated hospitals in Shiraz, Iran. J Infect Public Health. 2012;5(2):169-76. doi: 10.1016/j.jiph.2011.12.004. [PubMed: 22541264]. 28. Brady MT. Health care-associated infections in the neonatal intensive care unit. Am J Infect Control. 2005;33(5):268-75. doi: 10.1016/j.ajic.2004.11.006. [PubMed: 15947743]. 29. Meric M, Willke A, Caglayan C, Toker K. Intensive care unit-acquired infections: incidence, risk factors and associated mortality in a Turkish university hospital. Jpn J Infect Dis. 2005;58(5):297-302. [PubMed: 16249625]. 30. Gladstone P, Rajendran P, Brahmadathan KN. Incidence of carbapenem resistant nonfermenting gram negative bacilli from patients with respiratory infections in the intensive care units. Indian J Med Microbiol. 2005;23(3):189-91. doi: 10.4103/0255-0857.16593. [PubMed: 16100428]. 31. Barker J, Vipond IB, Bloomfield SF. Effects of cleaning and disinfection in reducing the spread of Norovirus contamination via environmental surfaces. J Hosp Infect. 2004;58(1):42-9. doi: 10.1016/j.jhin.2004.04.021. [PubMed: 15350713]. 32. El Shafie SS, Alishaq M, Leni Garcia M. Investigation of an outbreak of multidrug-resistant Acinetobacter baumannii in trauma intensive care unit. J Hosp Infect. 2004;56(2):101-5. doi: 10.1016/j.jhin.2003.09.024. [PubMed: 15019220]. 33. Sartor C, Jacomo V, Duvivier C, Tissot-Dupont H, Sambuc R, Drancourt M. Nosocomial Serratia marcescens infections associated with extrinsic contamination of a liquid nonmedicated soap. Infect Control Hosp Epidemiol. 2000;21(3):196-9. doi: 10.1086/501743. [PubMed: 10738989]. 34. Duckro AN, Blom DW, Lyle EA, Weinstein RA, Hayden MK. Transfer of vancomycin-resistant enterococci via health care worker hands. Arch Intern Med. 2005;165(3):302-7. doi: 10.1001/archinte.165.3.302. [PubMed: 15710793]. 35. Passaro DJ, Waring L, Armstrong R, Bolding F, Bouvier B, Rosenberg J, et al. Postoperative Serratia marcescens wound infections traced to an out-of-hospital source. J Infect Dis. 1997;175(4):992-5. doi: 10.1086/514008. [PubMed: 9086167]. 36. World Health Organization. WHO guidelines for hand hygiene in health care (advanced draft). Geneva: World Health Organization; 2006. 37. Farhoudi F, Sanaei Dashti A, Hoshangi Davani M, Ghalebi N, Sajadi G, Taghizadeh R. Impact of WHO hand hygiene improvement program implementation: A quasi-experimental trial. Biomed Res Int. 2016;2016:7026169. doi: 10.1155/2016/7026169. [PubMed: 27999811]. [PubMed Central: PMC5141532].